1. Cajun-Creole Cuisine Tasting, WildFlower restaurant will host a five course tasting featuring Cajun and Creole dishes and wine pairings, Thursday, August 31st, 8:00 p.m., at WildFlower, 192 Bleeker Street. $60/person (212.475.2355). 2. Vodka Flights and Bites, Join District restaurant for a pairing of three house-infused vodkas with specialty bar snacks, like black-peppercorn vodka with tomato-horseradish bruschetta, grapefruit vodka with cured salmon and caviar cream, and watermelon vodka with scallops and bacon, Wednesday, August 30th and Thursday, August 31st, at District, the Muse Hotel, 130 West 46th Street. $18/person (212.485.2999). 3. Downtown Farm Dinner: Big Apple Style, Outstanding in the Field will bring its communal farm dinner series to New York City with an event featuring a menu from Prune restaurant, Sunday, September 3, 4:00 p.m.. at the East Village Garden Oasis, La Plaza Cultural de Armando Perez community garden, E. 9th Street at Avenue C. $180/person, with a portion of proceeds benefiting JustFood.org (reserve online). 4. Cradle of Flavor, As part of the Asia Society's Asian Food Series, a panel of authors and chefs, including Fatty Crab's Zak Pelaccio, will discuss the cuisines and culinary traditions of Southeast Asia. The panel will be moderated by James Oseland, Editor-in-Chief of Saveur, and will conclude with a tasting and reception, Tuesday, September 5th, from 7:00 p.m. to 9:00 p.m., at the Asia Society and Museum, 725 Park Avenue. $30/person, pre-registration required (212.327.9271). As seen in Time Out New York, the Salad Sac promises to extend the life of your salad leaves (and herbs, greens, and other vegetables too) by enrobing them in super-absorbent 100% cotton teri cloth. As your coddled salad cools off in the fridge, excess moisture escapes into the pouch -- a veritable spa treatment for your veggies. But, does it work? Let us know in the comments. $10.95 at The Spoon Sisters. 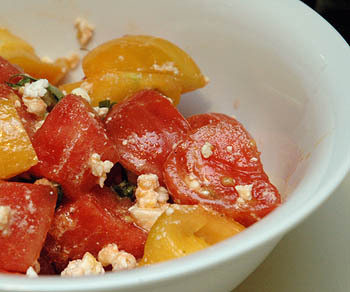 If you were trying to build the perfect summer salad, I don't know if you could do better than this refreshing combination of watermelon, heirloom tomatoes, and feta. 1. Dining for Darfur, Support a good cause and enjoy food and wine courtesy of T. Edward Wines, The Strong Buzz, and Blue Ribbon restaurants. All proceeds from the gala will go to the International Rescue Committee's efforts in Darfur and Chad, Wednesday, August 23rd, from 6:00 p.m. to 9:00 p.m., at the Puck Building, 295 Lafayette Street. $100/person (212-473-4401). 2. Bourbon, Whiskey, and Artisanal Cheese, Artisinal Cheese will host this class and tasting with special guest LeNell Smothers from LeNell's Wine and Spirit Boutique in Red Hook. Learn about the history of bourbon and sample it expertly paired with Artisanal's cheese, Thursday, August 24th, from 6:30 p.m. to 8:30 p.m., at Artisanal Premium Cheese Center, 500 West 37th Street, 2nd Floor, entrance on 10th Avenue (877-797-1200). 3. Meet the Farmers Lunch, Join farmers from Four Season Farm for a lunch featuring their produce at Blue Hill restaurant, Sunday, August 27th, 12:30 p.m., at Blue Hill, 75 Washington Place. $90/person (212.539.1776). The New York City Coalition Against Hunger has a useful Greenmarket google map: the push pins are color coded based on which markets have farmers who accept food stamps/EBT. You can also narrow your search by the day of the week the market takes place and the borough it's in. Gothamist again reports on blueberries, this time anticipating the imminent end of their season with tips on how to freeze and store. Tiny Banquet Committee has some beautiful Greenmarket photos. The New York Post ran an article yesterday on Tim Stark of Eckerton Farms. The piece includes descriptions of several of the tomato varieties he sells at the Union Square Greenmarket as well as tomato insight from Vinegar Factory's Eli Zabar ("never ever" refrigerate them, he says). Dan Barber of Blue Hill at the Union Square Greenmarket buying shell beans at Berried Treasures, eggplant at Sycamore Farms, and watermelon from Caradonna...Peter Hoffman, chef at Savoy, being filmed strapping produce on his bike cart...Colin Alevras of The Tasting Room, buying out most of Honey Hallow Farm's chanterelles and eggs (except for a small portion of the mushrooms being saved for Tocqueville), all on August 16th at the Union Square Greenmarket. Tomatillos ($2/lb.) from Migliorelli Farm and Oak Grove Plantation...celeriac (celery root, $2/lb.) from Paffenroth Farm...shell beans ($3/lb.) from Berried Treasures...super thin haricots vert ($6/lb.) from Berried Treasures...early blue plums from Locust Grove...yellow watermelon ($1/lb.) from Oak Grove Plantation. Apples are showing up all over the market: ginger gold apples ($1.20-$1.50/lb.) from Migliorelli Farm and Locust Grove...tydeman apples (tart, $1.25/lb.) from Terhune Orchards and Locust Grove...red free apples (sweet, hard, $1.25/lb.) from Terhune Orchards...paula red apples (tart, hard, $1.25/lb.) from Terhune Orchards...summer pippin (sour, hard, $1.25/lb. )...early macintoshes (semi-sweet, $1.25 lb.) from Locust Grove...early golden ($1.50/lb.) from Breezy Hill Orchard. The first pears of the season are in too, at Locust Grove and Caradonna ($1-$1.25/lb.). Berried Treasures has Kiwano, or "horned melon," which is in the cucumber family ($5/lb.). To eat, they recommend slicing the fruit in the center and scooping out the jelly inside. Honey Hollow Farm's chanterelle production is waning, but porcinis will be in soon. 10 p.m. (Tuesday night): Michael falls asleep in front of the T.V. watching an episode of Six Feet Under. He says he's lucky if he gets ten hours of sleep in a week. 2 a.m. (Wednesday morning): He gets out of bed and eats a breakfast of one hard boiled egg, mashed with mayonnaise and minced onion. He drinks a couple cups of coffee and hops in his van. The real challenge at that hour, he says, is avoiding deer on the drive down the hill. 6 a.m.: Michael arrives at the Union Square Greenmarket and sets up his stand. 7 p.m.: On a long day, he won't leave the market until 7 p.m. Many days, though, Honey Hollow Farm sells out and he can head back as early as 3 p.m.
10 p.m.: Michael arrives back in upstate New York, just outside Albany. What better way to ease into the work week than a nice, big chocolate chip cookie. Check out the information below for help in choosing the right one for you at the Monday Union Square Greenmarket. Berried Treasures, Cooks Falls, NY. At the Union Square Greenmarket Wednesdays and Fridays. Body & Soul. At the Union Square Greenmarket Mondays and Fridays. Breezy Hill Orchard, Staatsburg, NY. At the Union Square Greenmarket Wednesdays and Saturdays and the Orchard Street Market on Sundays (845.266.3979). Caradonna, at the Union Square Greenmarket Wednesdays and Saturdays. Creekside Barn, Orange County, NY. At the Union Square Greenmarket Mondays (845.986.3996). Conuco Farm, Nazareth, PA. At the Union Square Greenmarket Mondays, at the Orchard Street Market Saturdays, and at the Tompkins Square Park Market Sundays (917.306.8746). Eckerton Hill, Lenhartsville, PA. At the Union Square Greenmarket Wednesdays and Saturdays. Honey Hallow Farm, Schoharie River Valley area. At Union Square Greenmarket Wednesdays and Fridays. Locust Grove, Milton, NY. At the Union Square Greenmarket Wednesdays and Saturdays (845.795.5194). Migliorelli Farm, Tivoli, NY. At the Union Square Greenmarket Wednesdays, Fridays, and Saturdays. Oak Grove Plantation, at the Union Square Greenmarket Fridays and Saturdays. Paffenroth Gardens, Warwick, NY. At Union Square Greenmarket Wednesdays and Saturdays (845.258.4746). Sycamore Farms, Middletown, NY. At the Union Square Greenmarket Wednesdays, Fridays, and Saturdays. Terhune Orchards, Salt Point, NY. At the Union Square Greenmarket Wednesdays and Saturdays (845.266.5382). 1.Wine Tasting Without the Attitude, This tasting and lesson in choosing Greek, Australian, and California wines will be taught by Stefani Jackenthal, director the Neighborhood Tasting Society and wine columnist for Commuter Week, Thursday, August 17th, from 6:30 p.m. to 8:30 p.m., at the Steinhardt Building, 35 West 67th Street. $35/person (212.415.5500). 2. Garden Demonstration: Herbal Salads, Join professional chef and Wave Hill Garden Guide Pam Carey for this class and tasting on creating the perfect summer salad, Saturday, August 19th, 2:00 p.m., at Wave Hill, West 249th Street and Independence Avenue. Free with $4 admission (718.549.3200). 3. Blues & Barbeque, Hudson River Park will host this blues and barbeque festival, featuring day long blues acts and barbeque from New York City purveyors Brother Jimmy’s BBQ, Dallas Jones Bar-B-Que, Dinosaur Bar B Que, and Rack & Soul, Sunday, August 20th, from 2:00 p.m. to 9:00 p.m., at Pier 54 (enter at West 14th Street). Free admission (212.627.2020). 4. DiRoNA Week, New York restaurants Barbetta, Café des Artistes, San Domenico, Tocqueville, and Tribeca Grill will offer prix-fixe menus during this week long fundraiser to benefit Share Our Strength, a non-profit that fights childhood hunger, August 21st through August 25th. (212.297.2144). 5. Greenmarket Lunch, Join Lupa restaurant and Chef Steve Connaughton for a six course lunch featuring seasonal produce and Italian wine pairings, Tuesday, August 22nd, 12:30 p.m., at Lupa, 170 Thompson Street. $75/person (212.982.5089). No wonder the Coffee Geeks approve of the adorable and practical Grindenstein coffee knock box. This mini dumpster boasts a slick design, comes in six colors, and can tolerate sustained barista abuse. Since the receptacle collects organic waste to add to the compost pile -- as well as other green tips outlined in the Grindenstein brochure -- it also creates better living through environmentalism. Plus the compact size fits nicely with most home espresso machines, including Rancilio’s stellar Silvia. $28.95 with shipping included (not bad, considering it’s coming from Australia) at Grindenstein.com. The San Francisco Chronicle reports this week on new measures that Whole Foods plans to take to increase its commitment to sustainable agriculture and local produce, including a requirement that all Whole Foods stores buy from at least four individual local farms, a pledge of $10 million a year in loans to small, local farms, and Sunday Farmers Markets in Whole Foods parking lots. The Agriculture Department is proposing new legislation that would loosen the standards for what is classified as grass-fed, reports The New York Times. Under the proposed rule, it is possible that animals that were not raised on a pasture and were given antibiotics and hormones could still be considered grass-fed. Gothamist provides tips on how to prepare and store lettuce, which they like to get from Gorzynski Organic Farm at the Union Square Greenmarket. You can pick-your-own fruit at Phillips Farms in Milford, NJ every day except for Tuesdays, from 8:00 a.m. to 8:00 p.m. Go now and catch the tail end of the blueberry season. Peaches, raspberries, and blackberries are also ready to be picked (or will be shortly). Call 908.995.0022 for more information. Prospect Hill Orchards offers seasonal pick-your-own weekends (9:00 a.m. to 4:00 p.m.). Right now, peaches (donut, yellow, and white) are ripe and ready. Nectarines can be picked starting the second weekend of August. Come mid-September, apples, pears, and pumpkins will be available. Contact Steve, Judy, or Brad Clarke at 845.795.2383 for more information. Learn old-fashioned cheesemaking at Valley Shepherd Creamery in Long Valley, NJ. You'll get to make your own cheese wheel, which you leave in the Creamery's hillside aging cave and pick up when it's ready in 60 to 75 days. The next cheesemaking class is September 17th. It costs $129 and includes the cheese class, cheese tasting, a tour, luncheon, and the wheel of cheese. Call 908.876.3200 for more information. Baby organic carrots ($1.50/bunch) and hot peppers (6/$1.00) from HydroGarden Farm...hyssop tea ("licorice flavor, heals the lungs") and lemon verbena tea ($1.00) from Berried Treasures...cranberry beans ($3.00/lb.) and yellow plum tomatoes ($2.50/lb) at Migliorelli Farm...blackberries ($4.00/half pint) from Locust Grove and Breezy Hill Orchard...early red free apples ($1.50) from Oak Grove Plantation...more varieties of apples from Caradonna, including red delicious, pristine, golden delicious, empire, mutsu, and cameo ($.75 to $1.25/lb. )...cubanelles ($2.40/lb.) from Keith's. Due to popular demand, Lynnhaven now has feta in brine (which gives it its characteristic saltiness). Feta crumbles not in brine are still available ($5.00). Tamarack Hollow Farm is now taking orders for holiday ham, duck, goose, and suckling pig. Rhubarb and fava beans are essentially gone...cherries are becoming less abundant...only tri-star strawberries are left. Although the labels on their goods and the sign on their stand say "Just Rugelach," perhaps the name on their CENY placard - "Not Just Rugelach" - is more apt. In addition to the traditional Jewish treat, they sell a wide array of baked goods: everything from muffins, strudels, bread, and cookies to more uncommon items. Take the roast pork buns: Roselie Halik, who runs the company with her husband Tom, explains that when she was pregnant she was craving them and Tom developed the recipe for her. They liked it so much that they kept it around and sell it at market to this day. Both times I visited them at the Tribeca Greenmarket, numerous patrons came just for these doughy delicacies, which they sell for $1.00 each. Tom Halik started the company in 1995 after attending culinary school in Paris and working at the 5th Avenue Epicure in New York (where he met Roselie). He has come to be known as "the rugelach man" in Kearny, NJ, where they are based. Everything is made from scratch, every day, and Tom is always working to improve his recipes: "constantly developing," Roselie says. She tries all the recipes as her husband works on them, offering advice how they might be tweaked before they are finalized. "I'm his biggest critic," she says with a laugh. Despite the array of baked goods they sell, Roselie says that "people always come for the rugelach." Right now they offer four different flavors: walnut raison apricot, walnut raisin raspberry, chocolate hazelnut, and cinnamon raisin. She says they try to make seasonal varieties, but always keep their standbys, like the classic walnut raisin apricot. 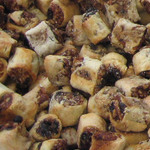 Their rugelach can be bought wholesale or through mail order and at any of their Greenmarket locations throughout the city (see FARMER INFORMATION). Rugelach is 50 cents a piece or $2.00/quarter pound. Hydro Garden Farm, Yaphank, NY. At the Union Square Greenmarket Mondays, Wednesdays, Fridays, and Saturdays (631.286.3423). Just Rugelach, Kearny, NJ. At the Tribeca Greenmarket Wednesdays and Saturdays, Brooklyn Borough Hall Greenmarket Tuesdays and Saturdays, UN Plaza Greenmarket on Wednesdays, Bowling Green Greenmarket on Thursdays, and 77th Street Greenmarket and Jackson Heights Greenmarket on Sundays (201.246.9211). Keith's Farm, Westtown, NY. At the Union Square Greenmarket Wednesdays and Saturdays (845.856.4955). Lynnhaven, Pine Bush, NY. 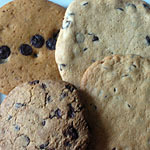 At the Union Square Greenmarket on Wednesdays (845.744.6089). Phillips Farms, Milford, NJ. At the Union Square Greenmarket Mondays, Wednesdays, Fridays, and Saturdays (908.995.0022). Prospect Hill Orchards, Milton, NY. At the Tribeca Greenmarket Saturdays (845.795.2383). Valley Shepherd Creamery, Long Valley, NJ. 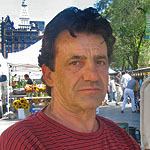 At the Union Square Greenmarket Wednesdays and Saturdays and the Tribeca Greenmarket on Wednesdays (908.876.3200).